The Internet is an addictive force. Even GoogleChrome is getting in on the act by creating toolbars courtesy of Quickrr to limit the amount of time we spend on pre-determined URLs (any Angry Bird fans out there?). It seems odd to mention Quickrr on a blog about slow, but in this case, quick(rr) is slow! JZ Knight offers a refreshing perspective on our self-flagalation (I must close Facebook; I must stop tweeting!). She doesn’t think Internet addiction is the real issue. She says it’s the platform for a countercultural shift in thinking. JZ Knight (www.Ramtha.com) is a leading self-help and spiritual expert who has become a respected advocate for self-empowerment, helping thousands worldwide to overcome trauma, depression, and addiction and to accomplish extraordinary feats while reaching high levels of success. She has worked with people from all walks of life and has offered guidance to such notable personalities as Salma Hayek, Shirley MacLaine, Robert F. Kennedy Jr. and Linda Evans. She’s also appeared on The Larry King Show and MSNBC. And today, she appears on The Power of Slow for you, dear readers. Please listen to my chat with JZ Knight about the Internet, consciousness and the future of virtual living! Something’s foul in the state of our schools. In her most recent episode, Katie Couric examines chronic fatigue in high school students who are buckling under the weight of academic performance on her CBS Webcast @KatieCouric. “For starters, it’s coming from our pressure-cooker culture,” says Vicki. But she also points to parents, college admissions and the media as further factors leading kids down a path of depression and ‘checking out’ because they can’t handle the pressures placed on them in our post-information age society. Another aspect that has led to these issues is teachers having to ‘teach to the test’ instead of fostering critical thinking that moves beyond regurgitation. Sustained fear, as we know, is the greatest energy blocker. It is what holds us back from taking that leap of faith. What if we lived in a world in which adult lives were balanced, too? What if we lived in alignment with our truest purpose, going for what makes our heart sing, not sink? As with our time abundant versus time-starved attitude, it is going to take a collective mindshift around what a ‘good education’ means. A sleep-deprived teen isn’t going to live up to his or her potential. Power to the Students! Power of Slow to the people! 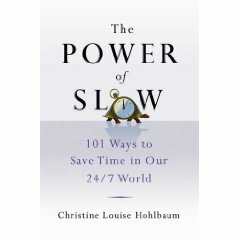 The power of slow is slowly making its way into the minds of others. So often I will see people blog about their power of slow moments, which delights me beyond belief. Recently, I sat down for a chat with a Munich-based language school called LbT Languages (Leraning by Talking) about myths, mindfulness and the gift of time.